The Bishops’ Conference of England and Wales have begun the rededication of our countries to Our Blessed Lady. 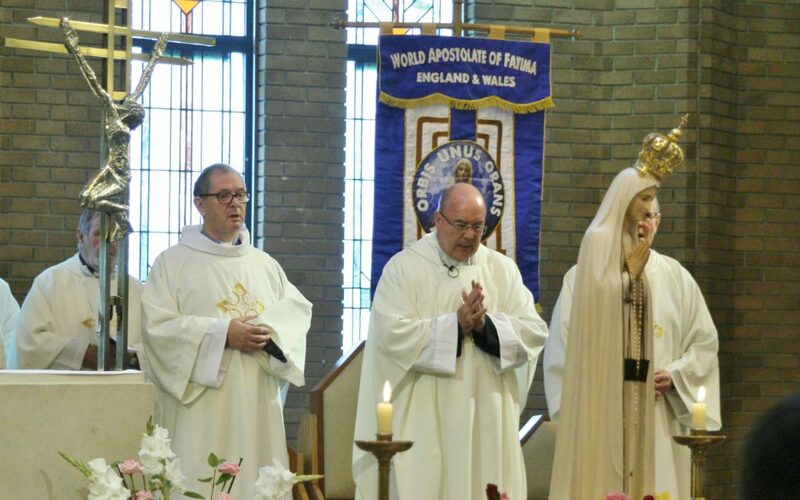 In the past year, the pilgrim statue of Our Lady of Fatima visited places including Middlesbrough, Hull and York and the statue Our Lady of Walsingham recently came to St Mary’s Cathedral. As part of this ongoing process, WAF is promoting the Five First Saturdays Devotion in honour of the Immaculate Heart of Mary, as requested by her to the three shepherd children of Fatima, Lucia, Francisco and Jacinta. Inspired by these words of the Mother of God we must encourage devotion to Mary’s Immaculate Heart, alongside the Most Sacred Heart of Jesus, by making reparation for sin. By trusting in Mary’s intercession, we hope to obtain the salvation of many souls, the triumph of Mary’s Immaculate Heart and an era of peace for all mankind. WAF is appointing promoters in each diocese to encourage prayer groups and parishes to start the devotion. We hope a network of groups will help stimulate a Rosary revival in the diocese and throughout the land and we would warmly welcome anyone who would like to join us. For more information email 3woldview@gmail.com or call me on 01759 380415.